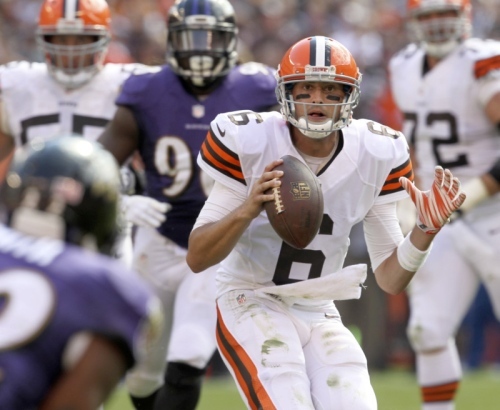 There was plenty of blame to around on Sunday as the Cleveland Browns saw their modest one-game winning streak come to an end at the hands of the Baltimore Ravens. So what went wrong? Let’s start with the offense, which for the better part of three quarters looked as good as it has all season long. The Browns put up three touchdowns – all in the red zone – against a Baltimore defense that had only given up one touchdown (none in the red zone) in the first two games of the season. In addition, quarterback Brian Hoyer had a stretch where he completed 14 passes in a row and avoided turning the ball over. Three plays for -2 yards that ended with a missed field goal. Six plays for 61 yards, the highlight being a 70-yard pass to Taylor Gabriel. That drive ended in a blocked field goal. Three plays for three yards that took all of 59 seconds off the game clock. Three plays for three yards that took all of 21 seconds off the game clock when all the Browns needed was a first down to ice the game. To summarize, the Browns ran 16 plays in the fourth quarter for a total of 65 yards – with 70 of those yards coming on Hoyer’s pass to Gabriel. The offense was 0-for-4 on third downs and went three and out on its final two series. The biggest killer was also the biggest play of the game – Hoyer’s long completion to Gabriel. All Gabriel had to do was catch the ball and head into the end zone, but after falling down while making the catch he was caught from behind before he could score. “Yeah, I’m a little upset, but at the same time, it just felt good getting my hands on the ball,’” Gabriel said after the game. Well, as long as he feels good, we guess it’s OK.
Defensively, the Browns were ripped on the ground again, giving up 160 yards to the Ravens. After three games, the run defense is giving up 153.7 yards per game, leaving it ranked 27th in the league. That wouldn’t have mattered, though, if the defense hadn’t broken on the final drive of the game, with the key play being Steve Smith’s 32-yard reception against Joe Haden. Haden’s right: guys are going to make plays. But he really needs to be the guy making the play in that situation. The special teams were once again a horror show, with Travis Benjamin somehow forgetting how to return punts this year, bad blocking and bad snaps on field goal attempts, and plenty of ugliness to carry everyone over until the Browns next game in two weeks. Now that we’ve worked our way through all the unpleasantries, we’re about to write something that some (many?) Browns fans are not going to like. As disappointing as Sunday’s game was, it shouldn’t come as that much of a surprise that the Browns lost. Everyone was fired up after the win against the Saints, but this Browns team is still figuring things out. For as well as he’s played this year, Hoyer has still only started a handful of games, he’s working with a backfield of all rookies and throwing to a group of No. 3 wide receivers. The defense isn’t as far along as we would have hoped for (see the rushing totals), and while they can be dominant in stretches – at one point on Sunday, they held the Ravens to just three points over four drives before the game-losing series – the defense still hasn’t put it all together on a consistent basis. It’s been frustrating because the Browns are just a couple of plays away from being 2-1 or even 3-0 on the season. Despite all the problems on Sunday, from blown plays to far too many penalties, all they needed to do was make one or two more plays and they would have walked off the field with a win. Which in some ways means this week’s bye is coming at a good time. The coaches can work on fixing the problems, while also reminding the players (and each other) the importance of playing for a full 60 minutes. You can see the team moving in the right direction and the picture starting to slowly fill in around the margins, but it’s not there yet. To circle back to our opening, the Browns are still working on the transition from crawling to walking. Just how far they are from being able to run remains to be seen, but there are some encouraging things to take out of the first three weeks of the season, even with a 1-2 record. 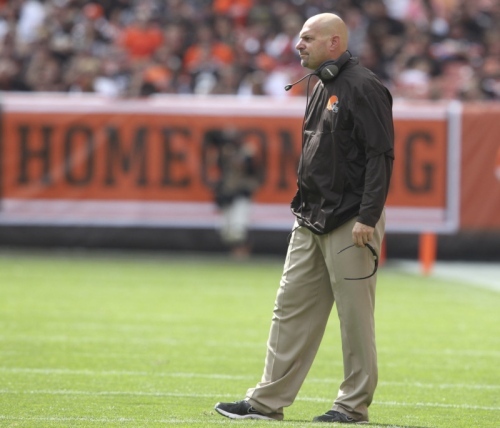 The running game remains viable, Hoyer has taken control of the quarterback position, and the defense has shown flashes of being a good unit. It’s just too bad that one of those encouraging items isn’t a couple of more wins.